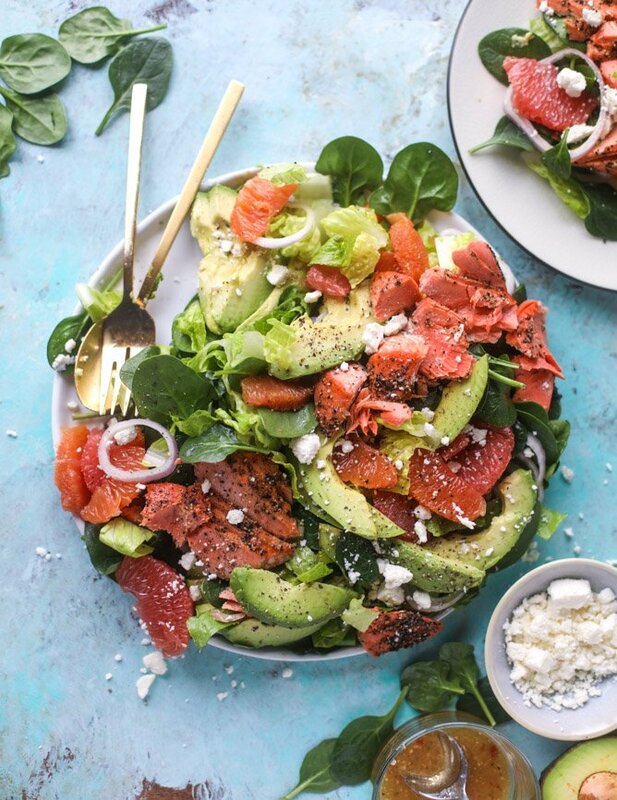 Salmon Citrus Salad with Avocado. Oh my gosh. Guys! With a salad as colorful as this, how could you NOT want to eat it? As we near the end of citrus season, I couldn’t allow one of my favorite recipes to slip on by. 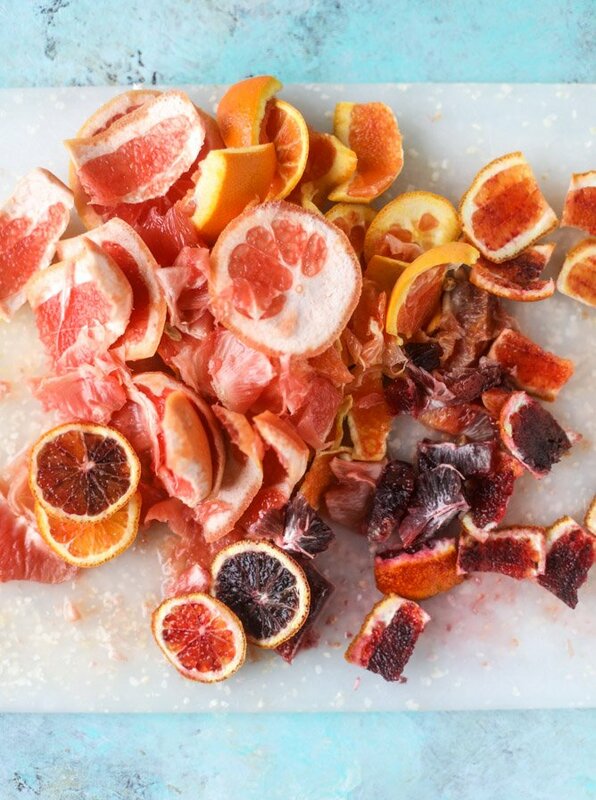 I know I was super heavy handed with the blood oranges this year… and the lemons… and the grapefruit. And I still have some lemon recipes to share because I’ve become an old woman and love me some lemon dessert. But for now, just one more savory citrusy recipe to get us through. I think. Plus, look at those avocados? Half the time I want to slice an avocado on a plate, season it with salt and pepper, drizzle on some olive oil and call it a salad. I mean, I think that’s acceptable. It’s almost what I did here but with just a leeeeettle more fluff. If I had a choice of salad toppings, whether it be chicken, steak, salmon or shrimp, my answer is always, always salmon. 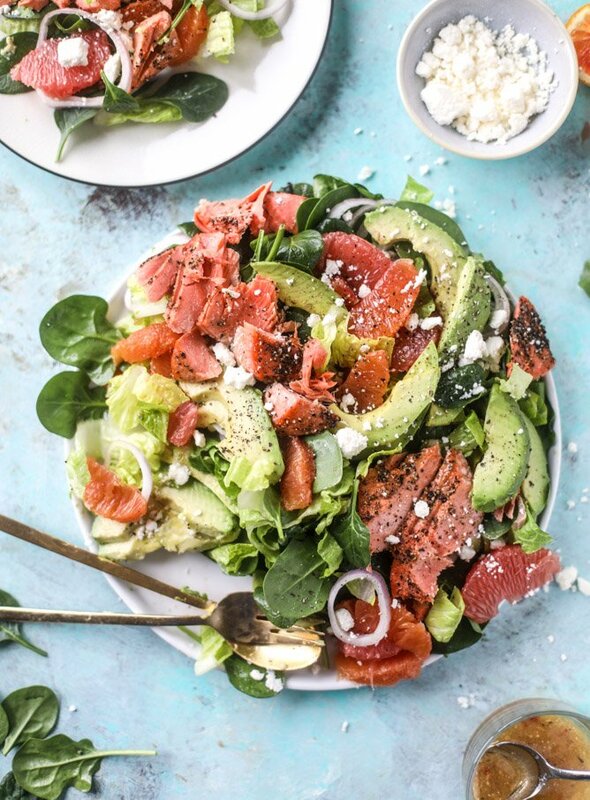 There is something so wonderful about salmon in a greens salad. I think it’s the flakiness. I’m sure of it. You get a little piece of the fish with each bite. It’s like BUTTER. Plus, I love when it’s combined with feta. I ignore all the no cheese + seafood rules! For this salmon, I did a quick broil which is my go-to method. If your salmon pieces are already cut and on the smaller side, this can take six or seven minutes. It’s SO fast and easy. If you have one large filet, it’s still under 15 minutes! And it yields a lovely, slightly crisp top. Allllll about that texture. The citrus? 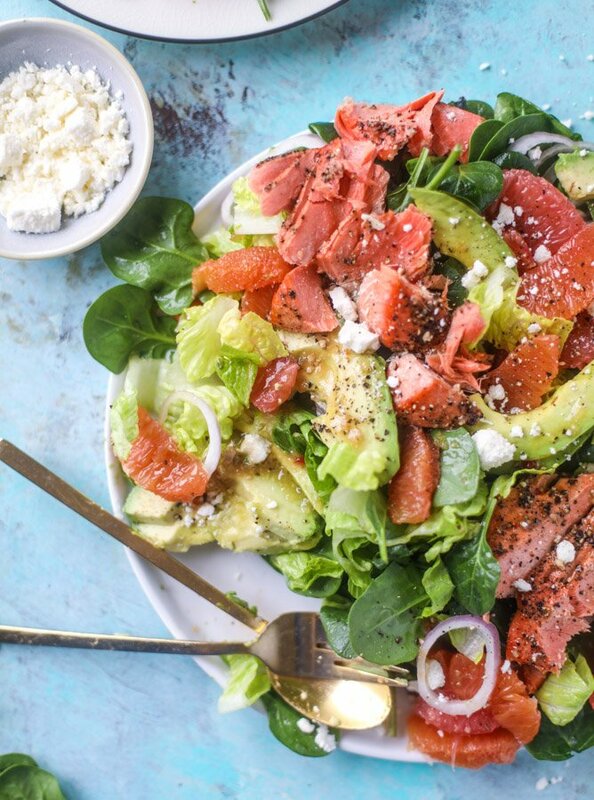 Any type of orange works wonders in this salad. The only thing I feel like you have to watch out for is the grapefruit. I really love it, but I also really love grapefruit. I’ve made this for people who love grapefruit but found the flavors to be a bit weird together (salmon + grapefruit? hmmmm.) so you might need to test it first. I do like more oranges than grapefruit. And with just a few grapefruit wedges and the lemon vinaigrette? The flavor is super bright! Oooh ooh. One more thing! With the start of lent today, I know a bunch of you are looking for fish and seafood recipes. Some of my favorites are listed below and I have an awesome shrimp recipe coming next week. Shrimp sort of lost its luster for me when I was pregnant with Max, but I think I found a way to love it again. Woohoo. When it comes to salmon, I am the queen of flavor. This toasted sesame ginger salmon is one of the most popular recipes here on the site! I also love this thai curry peanut salmon even though it’s less than desirable to look at. Tortilla crusted salmon sliders? HELLO. Pan crisped salmon with a lighter dijon cream? I think you can see where I’m headed with this. AND! 30 minute cajun salmon. With salted lime butter. SALTED LIME BUTTER. As for non-salmon options, we have beer battered fish tacos with mango margarita salsa (!!! ), BBQ shrimp avocado toast (yes I did that), gouda grits with brown butter shrimp, these hugely popular thai coconut curry shrimp noodle bowls and spicy parmesan shrimp. Eeeep. Preheat the broiler in your oven to high and set the oven rack about 6 inches below it. 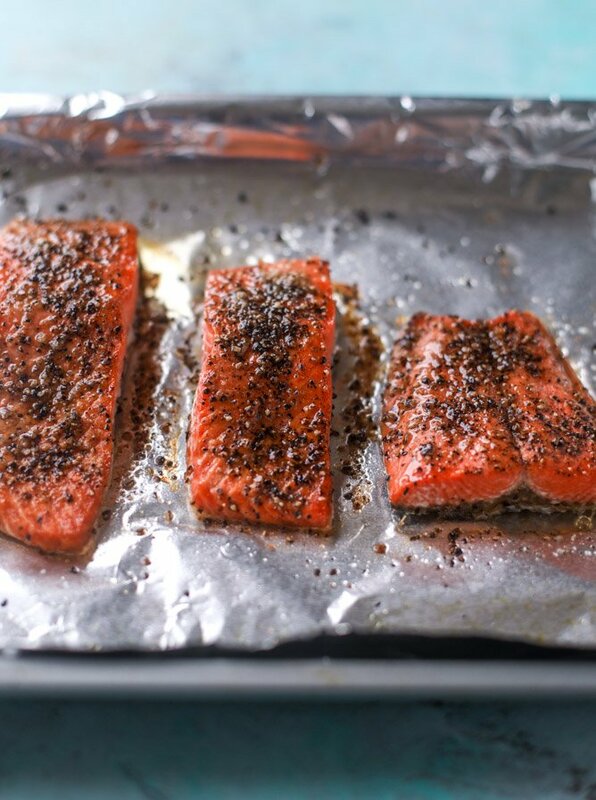 Place the salmon on a baking sheet and brush it with the grapeseed oil. Season it with the salt, pepper and garlic powder. Broil the salmon for 6 to 8 minutes, or until just opaque and flakes easily with a fork. If you’re doing a large filet, broil it for 8 to 10 minutes, then check. The time will depend on the thickness of the filet! 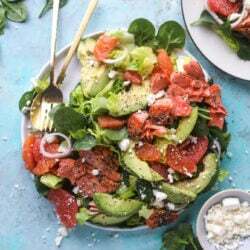 To assemble the salad, toss together the lettuce with a pinch of salt and pepper, the orange segments, grapefruit, avocado and shallot. Drizzle with the vinaigrette. Sprinkle with the feta before serving. In a bowl, whisk together the vinegar, lemon juice, honey, garlic, salt and pepper. Continue to whisk while streaming in the olive oil. This dressing stays great in the fridge in a sealed container for a week or so, so feel free to make a double batch if desired! And I’d also like a meyer lemon margarita. Who made up that silly rule of no cheese with seafood? I love parmesan on my scampi! 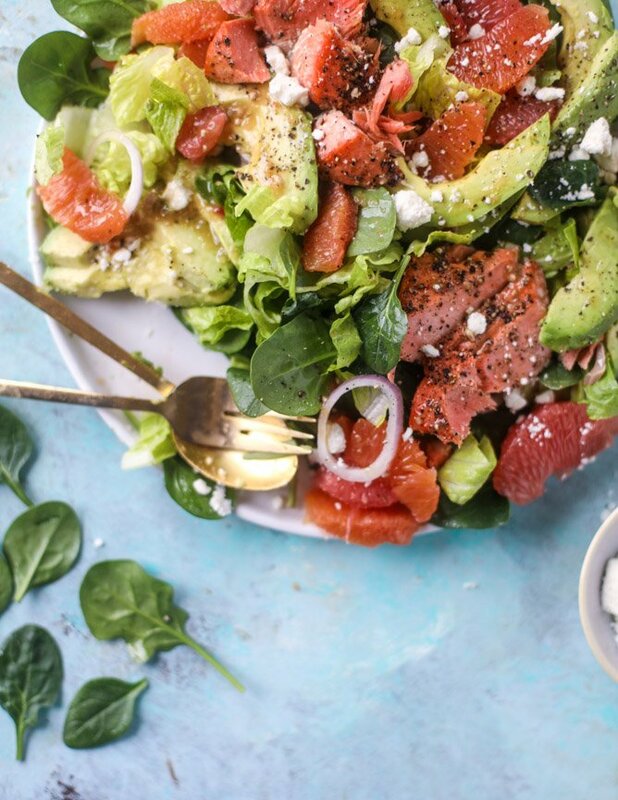 Salmon on a salad is my favorite thing to put on a salad in the history of forever. 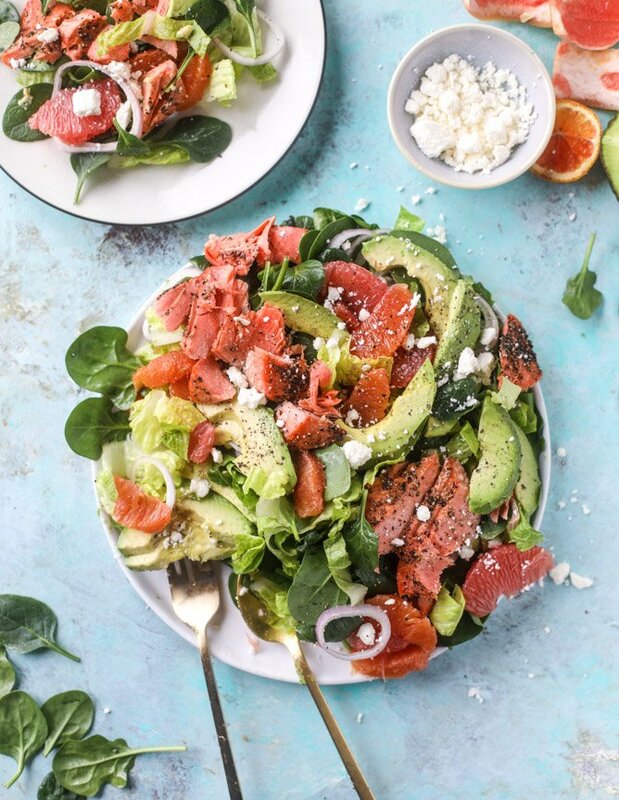 Also feta and salmon are my dream team. Whoever said that seafood and cheese doesn’t go together is insane. Totally magical! This is my everything. I am actually mad that I didn’t eat this for lunch today. It is basically my favorite foods on a plate. I can’t wait to try it! I had my last ultrasound earlier today and afterwards my husband and I went to Krispy Kreme and had a donut with chocolate milk. Now I’m making this salad for dinner. It’s called balance, right? Thanks for the beautiful recipe! MEYER LEMON MARG* AND SALMON? SIGN ME UP!!!!!! I am expecting a recipe, Jess. You can’t throw that out there and just leave it. I’m ALL for ignoring the fish/cheese rule. Dumb rule in my opinion :) Gotta try this, you make the prettiest salads!! I need to make this ASAP! Looks amazing, AND such a great balance of nutrients. Love citrus flavors and fruit, but now we have watermelon, berries, cherries, stone fruit in the horizon and looking forward to. I love all of your salmon recipes (OMG that toasted sesame ginger) and this looks amazing. BTW, regarding slicing the avocados w/ drizzle of oil and salt and pepper and calling it a salad, that’s how my Mom does it and when we were growing up she called it salad and always made sure we finished our “salad”. Sometimes she added tomatoes. Love the idea and respect your works of art. Will be back for more refreshments ! Thank you so much and have a pleasant weekend ! Thanks for this recipe, I can’t wait to taste it! Can you tell me please, how it tastes without avocado? Made this tonight and it was delicious, such wonderful flavours! Thank you for this recipe!